SCM Microsystems has released a new smart card terminal that meets requirements for the German eHealth Card program. The company’s eHealth 100 will allow secure sharing of patient information and will be part of a network infrastructure that will eventually connect doctors, pharmacists, hospitals, medical facilities, and insurance companies. Fremont, CA, – SCM Microsystems, Inc., a leading provider of solutions that open the digital world, announced that it is the first manufacturer to offer a smart card terminal that addresses all requirements of the German eHealth card program for the secure handling of sensitive patient data. The eHealth 100 is the first health card terminal compliant with the SICCT (Secure Interoperable Chip Card Terminal) specification–a catalog of requirements for smart card terminals used in the German eHealth program telematics infrastructure, a secure network through which information about patients and their care, such as diagnostic findings and treatments, can be shared. In the future, the telematic network is expected to connect all doctors, pharmacists, hospitals, medical facilities and insurance companies within Germany. SCM’s eHealth terminal is compliant for use with both the electronic health card (eGK), which is planned to be issued to 82 million insured individuals in Germany beginning in 2007, and the health professional card (HPC), which is expected to allow every professional in the health care sector – general practitioners, pharmacists, therapists, alternative practitioners or physiotherapists – to securely access and edit patient data. Insurance information and other healthcare data such as prescriptions, emergency data and medical records is stored on the eGK card and can be immediately accessible whenever and wherever it is needed. In addition, the eGK card empowers patients to participate more fully in their medical care by giving them the ability to share additional information with health care providers. The SICCT specification was developed by the IT industry organization, TeleTrusT e.V., in close relationship with gematik (Gesellschaft für Telematikanwendungen der Gesundheitskarte mbH), which is the planning and oversight body for the eHealth card telematics network. The gematik was founded in January 2005 by leading organizations in German health care and is responsible for the implementation, maintenance and further development of the electronic health card and its infrastructure as the foundation for linking the entire network of healthcare providers throughout Germany. 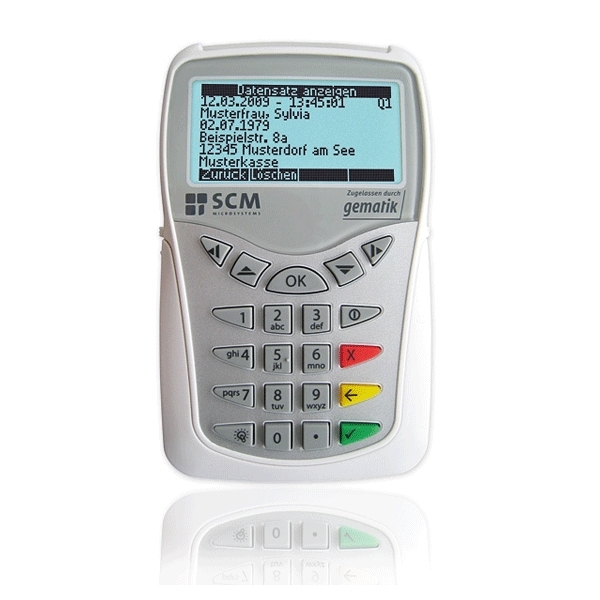 The eHealth 100 smart card terminal from SCM Microsystems is currently being tested by the gematik. All components of the electronic health card program must be tested by gematik before they can be applied in pilot situations – beginning with test data and later with actual patient data in selected test regions. This includes the electronic health card for insured individuals, the health professional card for healthcare providers, the smart card terminals as well as the applications running on the eHealth cards. In the course of the implementation of the German Health card, about 188,000 general practitioners and dentists, 2,200 hospitals, 21,000 pharmacies, and 270 insurance companies in Germany are being equipped with a Health card terminal. For more information on the German eHealth card program, please visit the German Federal Ministry for Health Internet portal at www.die-gesundheitskarte.de.